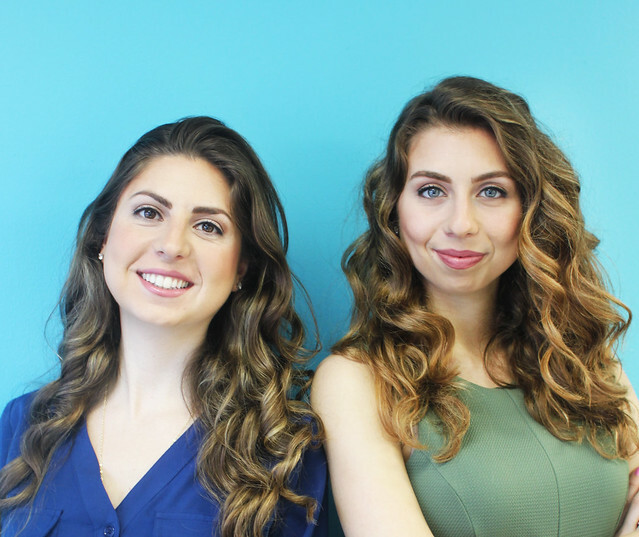 Rosy and Donna Khalife, Co-Founders of Surprise Ride. Photo provided by Surprise Ride. That morning started out just like every other morning and then suddenly we were packing our bags to get to Hollywood. When adults are buying subscription boxes meant for kids 6-11, keeping the boxes for themselves, you know you must be doing something right.Â Rosy and Donna Khalife, the sisters behind the Washington, DC based startup, Surprise Ride, the monthly subscription box created to foster creativity in kids through hands-onÂ projects, are now looking at expanding their line to include boxes meant for adults sinceÂ their boxes marketed to kids have gained so much interest from older audiences. In 2013, the sisters appeared on Shark Tank, but left Hollywood without a deal from any of the show’s investors. Not surprisingly, (pun slightly intended), the show still helped grow their customer base, and they’ll even be appearing on the season premiere of Beyond the Tank, giving you a closer look at what’s happened since the sisters’ first appearance on the show. You can follow Surprise Ride on Facebook or TwitterÂ for the latest news on the show’s air date, and until then, you can find out what the sisters had to say about all things surprising and creative in our interview below. Rosy Khalife:Â I studied marketing in undergrad, and have a business background. I started Surprise Ride right after that. We started it because we have such a passion for making kids creative. Our dad was an artist, and growing up we would do a lot of activities with him, and that really sparked the interest in doing a company like this. We also have two nephews, and we do activities like this with them, andÂ we wouldÂ see how much they enjoyed doing hands on things, hands on activities, arts, crafts, science, things like that, and that really was the incentive for starting Surprise Ride. DonnaÂ Khalife:Â My background is also in business. I worked on Wall Street for a number of years, in mergers and acquisitions, helping companies think about their growth strategies. After that I went back to business school. I got an MBA from Harvard and really focused on entrepreneurship. I fell in love with the idea that you could start a company that is profitable and sustainable, but also has an impact on the community. I was very excited to start something after I graduated so I spent about a year really soul-searching and really thinking about what that somethingÂ might be. One afternoon when we were watching our nephews immersed in their iPads as they sometimes are, it sort of hit us that it wouldÂ be great to give them some activities, make it really easy to sit down and do something engaging in the real world. The idea really grew very organically between myself and Rosy, and was very much inspired by our own childhood, growing up with a dad who was an artist. PP:Â Can you share a little about the process of selecting what goes inside the boxes each month? DK: Â The process takes several months. We collaborate with a Montessori school teacher on the team who works with our Director of Product and a team of designers, illustrators and creatives, in really bringing a theme to life. We also reach out to experts on various subjects and make sure that the activities that we are choosing are ones that kids would find engaging. Often times the best ideas comes from the kids themselves-we do focus groups with kids and parents and they often have some of the most brilliant ideas that really spark the beginning of a theme coming to life. All the content that you see in our packages is original. Everything from the lessons, the fun facts, all the information about the different themes. The products are both created by us and curated and selected from a group of providers who typically cater to enrichment programs and after school camps. We source products from all over the world. For example, we had an ancient Egypt theme, where we had children excavate for treasure out of a pyramid. It was a lot of fun, and we also included papyrus paper that was imported from Egypt. We really wanted to spark their curiosity around it by allowing the kids to really touch and feel this really cool item. PP: There is a page on your website to sign-up for an invite only list for boxes for grown-ups. Can you share a little more about the plan for offering Surprise Ride to grown-ups? RK: Â We learned that lots ofÂ adults our getting our boxes that are designed for kids. ManyÂ adults have a 9-5 job that doesnâ€™t allow them to be very creative and Surprise Ride is their creative outlet. They get it and they open it up and do the activities and they learn something. We get emails from them saying, “Wow, I never knew this,” or “this is really interesting and Iâ€™m a 40 year old”, so that’s kind of how that all began. We dont have a set date just yet but we do have that invite list up and we get emails every day from people adding their emails and asking us about it and that’s something that is in the works, but right now we are really focused on creating an awesome product for kids. 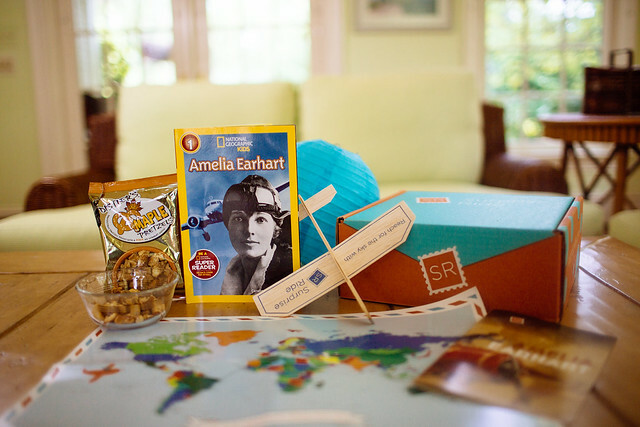 The Amelia Earhart themed box. Photo provided by Surprise Ride. RK:Â We were doing a focus group andÂ asking kids what they would like to see as the next Surprise Ride theme because they always have the best ideas. One kid raised his hand and said he would love if we could do a box on curing Ebola. It is so sweet and really touching to see how his mind was working differently from ours and that is what he would want to see in a box on, so that was really cute. DK:Â Ebola and cancer he said. That was really sweet. That is probably my favorite as well. DK:Â What surprises me most is how everyday I wake up thinking I have a sense of what awaits me that day, but Iâ€™m often proven wrong. Things will come up, everything from having to put out a fire drill because an item is being delayed and we need to make accommodations for it, to getting a great phone call from a potential partner and suddenly having this amazing opportunity that we need to prepare for, or having the opportunity to go on television like we did when we went on Shark Tank. That morning started out just like every other morning and then suddenly we were packing our bags to get to Hollywood. The biggest surprise for me has been how unpredictable and how much of a roller coaster it is. RK:Â : I think Donnaâ€™s answer is absolutely spot on and that resonates with me as well, but I think something that youâ€™d preempt is that as you grow and you have more employees, and the business continues to grow, youâ€™re kind of working harder in a different way, instead of doing all the work yourself youâ€™re reviewing others people work, youâ€™re managing employees, your role shifts, instead of executing youâ€™re doing more high level strategy, so I think you have to be able to adapt with the company as you grow, and continue to grow on a personal level as well and be able to manage employees and do all these different things that werenâ€™t part of the case when it was just a two person team. When you do express yourself creatively your mind is less jumbled and things make a little bit more sense. Creativity is very powerful. PP: I see that you post a lot of quotes on your Instagram page. What is your favorite quote? DK:Â Itâ€™s anonymous, or at least we donâ€™t know who said it, but my dad, when we were growing up, always used to say, â€œThere are those who make money and those who make historyâ€ and as an artist he was always inspired to make history, and he instilled this message in us at a very young age, the thinking that you can make your mark on the world and actually have an impact on people. Thatâ€™s a quote that has always stuck with me as Iâ€™ve chosen my career path. I donâ€™t know who said it and Iâ€™m starting to wonder if my dad made it up because I cant find someone to attribute it to, but itâ€™s probably one of my favorites. RK:Â One of my favorites is an Amelia Earhart quote, â€œAdventure is worthwhile in itself.â€ That has always really resonated with me. PP:Â Do you subscribe to any subscription services? RK:Â I subscribe to Birchbox. I also like food subscription services, Iâ€™m a bit of a foodie. DK:Â Besides Birchbox, do I subscribe to anything else? I canâ€™t remember (laughs). Itâ€™s a little hard to answer because we are subscribed to so many services, not just personally, but as the founders of a subscription service, we subscribe to the services to learn and to continue to grow. I love getting every single one of those, so Iâ€™m not sure if itâ€™s personal or professional anymore. The one I do love getting delivered at home is Birchbox. I knew the founders when they started it, coming out of Harvard Business School, and itâ€™s been so much fun to see that company evolve, reaching over 1 million customers now. Itâ€™s so much fun to get something in the mail that is not another bill, or another piece of advertising, but rather something that is fun and playful and hand selected just for you. I love unboxing my little Birchbox. PP: How do you express your own creativity? DK: I write and I draw. I use charcoal when I draw and I just love how quickly you can get the sketches out and get your thoughts out. After I draw I always feel like I can have these moments of silence and feel completely at peace. When you do express yourself creatively your mind is less jumbled and things make a little bit more sense. Writing is another way that I do that. I just write for fun and a blog on the side. Â Creativity is very powerful. RK:Â I cook. I cook every day. My creative outlet is experimenting in the kitchen. 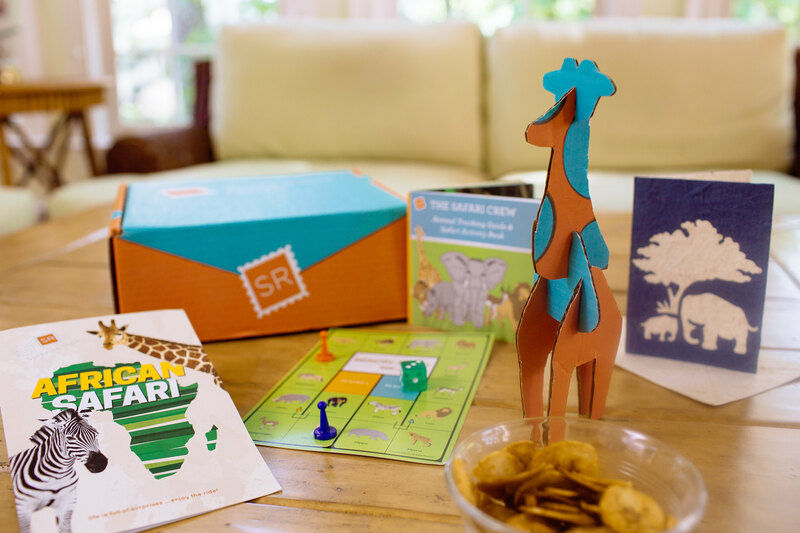 The African Safari themed box. Photo provided by Surprise Ride. PP: I read the story about how you taught a boy on a plan how toÂ make origami cranes, telling him about the Japanese legend that promises anyone who folds a thousand cranes gets a wish granted, maybe even eternal good luck. You said you didn’t know what he wished for. What do you wish for? DK:Â One of the things that has always been very meaningful for me is-as kids we didnâ€™t really grow up with much, we were refugees as children. I remember leaving on a boat from Lebanon during the war and coming to this part of the world. Weâ€™ve come such a long way since and Iâ€™m always reminded of what it was like to grow up with very limited means and not lots of toys and lots of things at home, but a lot of love. One of the things that I wish for is that we continue to build something, build a company that can bring joy to kids at times maybe when they need it most and I think that when youâ€™re in that young age, those are very formative years, and the more joy we can bring the more you can grow up to be a happy an engaging person. Thatâ€™s one thing that I wish for that keeps me rooted as we overcome some of the challenges of starting your own company. RK:Â A living wish that I feel very blessed to have every day is doing something that I really believe in and being able to wake up in the morning and feel passionate about a job that doesnâ€™t really feel like a job. I think a lot of people donâ€™t have that luxury, and so I wish this continues to be the case throughout the rest of my life, that Iâ€™m happy doing something and happy making an impact. PP: What is the best surprise you every received? RK: I was in college at the time and I really wanted to travel to London to study abroad. Things were kind of all up in the air and I might not have been able to travel and study abroad there. I was at home and my parents called me and they said, â€œRosy, youâ€™re going to London. We bought your ticket. Youâ€™re going to study abroad. â€œ That was a really amazing surprise. DK: When I hear the word surprise Iâ€™m always reminded of this time when I was turning nine and I walked into the living room and the whole family had invited friends and neighbors and threw me a surprise birthday party. It sounds cliche but it is still one of my favorite surprises. I was just so touched as a kid to see so many people there to celebrate my birthday. As a child youâ€™re used to kind of leading the charge on birthdays, and this was one time where they had organized it for me and it was really touching. I always tell people that if no one has ever thrown them a surprise birthday party, I want to know about it, because I will do it. Itâ€™s just such a special feeling that you get.